A subsequent post confirmed the post, and I called the GSR poker room to get my own independent verification. I canceled my room reservation and managed to get a $30 credit for my flight, but the rest of the ticket was gone. Apparently the first event—a $100K guarantee—had fallen short by some 30%, and to prevent something similar from happening on the following weekend’s $200K, they just canceled the rest of the series. When is a guarantee not a guarantee? When your airline reservations depend on it. That put me in a foul enough mood that I went out to Encore and took fourth place for a small cash in their $1K Sunday night guarantee. Played a dozen more events over the next couple weeks without a cash, then got in the 10pm $500 guarantee at Encore (after busting out of the weekly $10K at Final Table) and chopped it two ways. Since it’s more cost-effective to purchase airline tickets a couple weeks out, I’d already bought a flight to Vegas with a couple of Wynn Fall Classic $100K and $250K guarantee events in mind, with daily $15K Caesars Palace Poker Classic series events to back me up. I knew they wouldn’t be canceled. Took an early Monday morning flight to get to the Wynn, made my way over to the Encore side of the complex where the big events were starting out, and picked up my ticket for the second of two flights for the $100K, then waited a couple of hours in the coffee shop. I played one hand. Opened with A♥5♥ and got a substantial raise from the other end of the table. The flop was 2♥9♥4x. On that board, I’m statistically ahead of kings and almost even with aces. Obviously, that didn’t work out, as the guy with kings went all in on the flop and I took the chance that didn’t pan out. Not a glorious start to the week. It was a long, hot walk in the sun down to Caesars, where I got into the $15K. I made it through more than half the field but never really found a good footing and busted around 90th of 214. Jumped into the 4pm PLO game. I enjoy the various forms of Omaha (except Big O, which is an abomination), but I play more PLO8 than PLO and not much of that, so I was pleasantly surprised to make the final table—even in a field of only 36—but I only made 8th place and missed the money. Got up the next morning and took another shot at the noon game at Caesars. More accurately, I took two shots, as it looked like the tournament might not make the guarantee at the time I first busted. By the second time I busted, it had made the guarantee. Again, I made it through about 60% of the field (though this time I had to shoot two bullets to do it). That afternoon’s Double Stack Turbo game was already under way and it didn’t look like there were a lot of players, so I decided to skip it, got some dinner and a rest, then headed to the Venetian for the 7pm game there. Tuesday night is a $150 buy-in Green Chip ($25) Bounty tournament. I’d played a bounty game at the Venetian during my summer of ignominy in Vegas last year; I was determined to do better this time. Our table was getting crushed by a woman a couple seats to my right who said she was a former dealer from the San Diego area. I was doing okay, but when I was up to about 40K, a quick count of her stack gave me an estimate of 90K or more. I kept plugging away, and even though I didn’t acquire a monster stack, I seemed to be able to find the pressure points on short stacks. Suddenly, it seemed, we were down to the final table, and I had two-thirds my buy-in in bounties safely in my pocket. 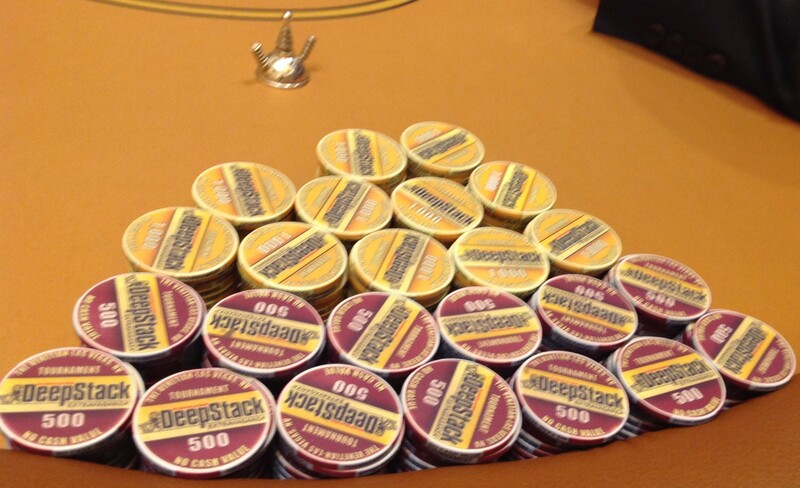 The woman with the early massive chip stack was the short stack by the time we got to final, and was the first to go. I started accumulating chips, getting up to second place with 175K (with the 200K chip leader on my immediate right). Over the course of the final, I took four more bounties. My stack did get whacked at one point after that photo, knocking me down to 80K, but I quickly climbed back over 100K and managed to build up to 200K as we got down to four players. A couple propositions for a deal had been discussed, with the usual wrangling and posturing. The chip leader wanted $300 more than anyone else in an otherwise equal split; the old guy with the short stack said if he was in it at four players there’s be no more talk of a deal. 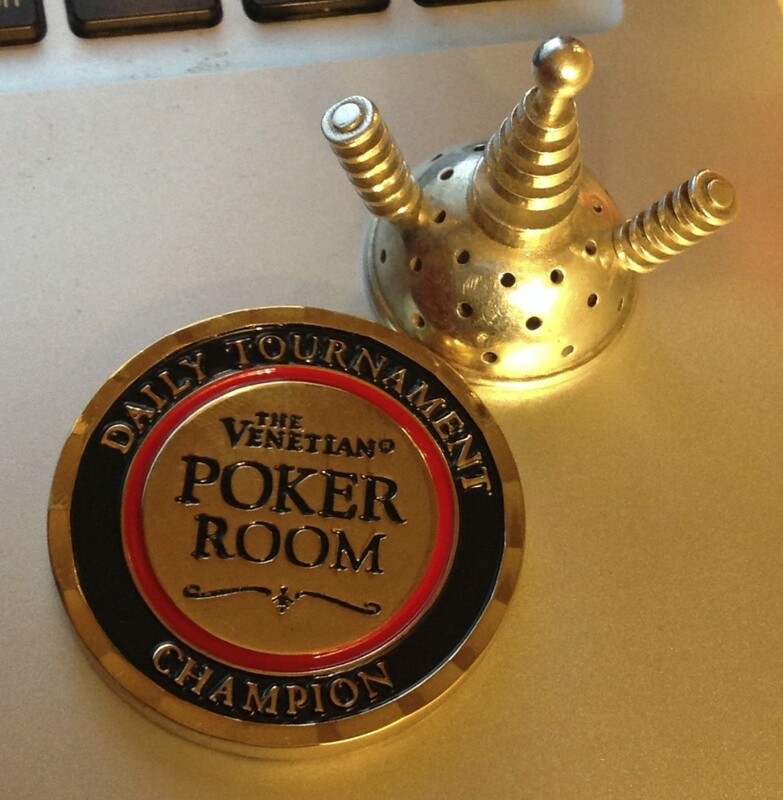 In the end, though, the two bigger stacks got an equal amount, the old guy and the other stack got a smaller, equal amount, and since I’d just taken the chip lead, I got the hardware. My second shot at the Wynn the next day went a lot better than the first, but not well enough. The first flight of the $250K guarantee had played until just before 10pm the night before. I was over chip average for over five hours on the second flight, then made a stupid mistake followed up by another, and was out and on my way home within a couple of hours. This entry was posted in General Poker, Live Games, No Limit Hold'em, Pot Limit Omaha, Tournaments and tagged Encore Club, Grand Sierra Pot of Gold, Reno, The Final Table by Poker Mutant. Bookmark the permalink.